On the heels of Samsung’s S10 series, can Huawei’s P30 and P30 Pro stand out from the crowd? 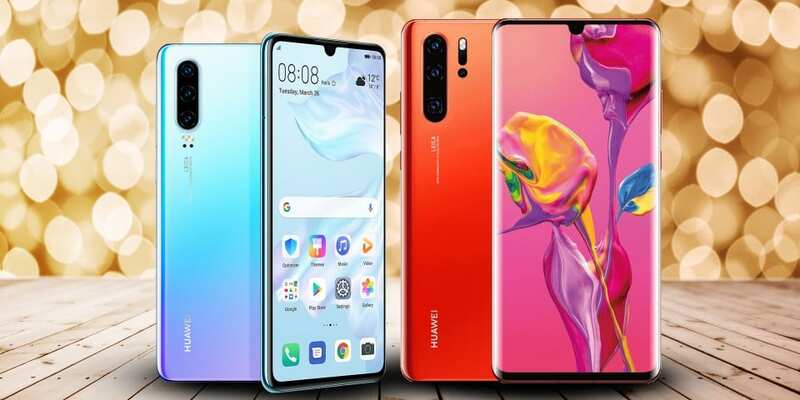 At its launch event in Paris yesterday, Huawei unveiled its new P30 series – the P30 and P30 Pro. The smartphone giant claims its new addition to the P series lineup will continue its focus on photography, while bringing in new technology revisions, including removing the earpiece entirely from the phone. The P30 follows the launch of the Huawei P20 and P20 Pro in April 2018, which sported the world’s first Leica-engineered triple camera and a sleek, pearlescent design on the rear of the phone, giving it a noticeably more luxurious look than its predecessors. The P30 series borrows some of the same camera technology and striking design notes from the previous P20s. So, what exactly will you get if you upgrade to the P30 and P30 Pro? Have you settled on a new Huawei device but still unsure which to go for? Read our guide on Which Huawei or Honor mobile phone should I buy? Huawei has never been discreet about its mission to set the industry standard for mobile camera technology. The manufacturer has stuck with its Leica-engineered camera technology, as we’ve seen on the last three iterations of the ‘P’ series. Last years’ P20 had two rear cameras, while the P20 Pro had a triple rear camera. 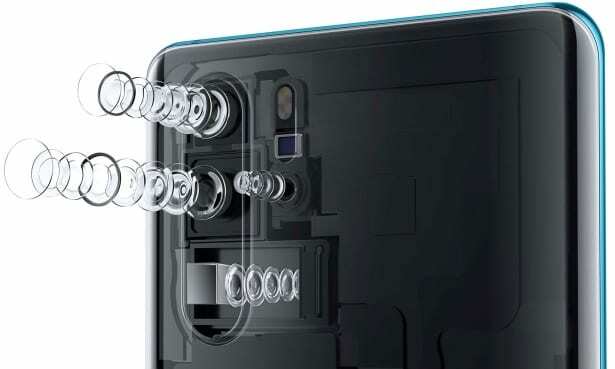 Huawei has upped the ante where lenses are concerned, adding an extra lens on the P30 to give you three lenses – 40Mp Wide Angle lens, 16Mp ultra-wide angle lens and 8Mp 3x telephoto lens. The P30 Pro goes a step further with four lenses and some extra megapixels in the mix. Built-in image stabilisation called AIS, to produce more stable pictures. ‘Handheld Night Mode’ feature, which appears to capture clearer images of landscapes, even when taking pictures at night. 50x digital zoom capability allows you to close in on fine details. Huawei Dual-View Video, so you can capture two videos of the same landscape simultaneously, both a wide-angle and close-up view. The magical, disappearing smartphone notch continues to get smaller, as Huawei introduce an ‘Ultra Small’ notch to make the most of your display. The P30 series will have a ‘Dewdrop’ display, meaning the screen is hardly interrupted at all by the front camera. The P30 will have a 6.1-inch display and the P30 Pro will have a display of 6.47-inches, which is larger than the Samsung S10+. Both smartphones are at least 3-inches larger than their P20 equivalents, and will both come with OLED Full HD+ resolution. You may be wondering where the speaker will fit into the display. 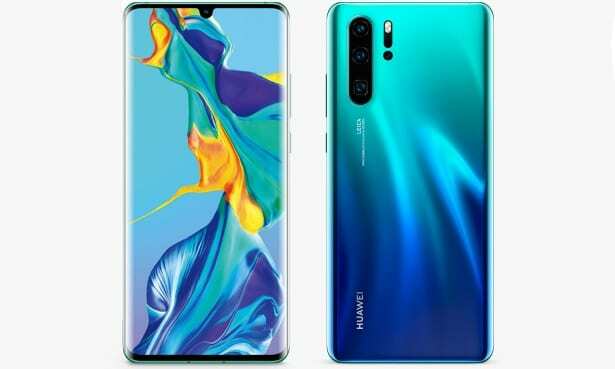 Huawei has done away with the speaker entirely, creating what it calls ‘Acoustic Display Technology’, which emits sound directly from the display. We’ll be looking forward to putting it through its paces in our call-clarity lab tests. The P30 will have a 3,650mAh battery, which tops the P20’s 3,400mAh. The P30 Pro is the real standout star where battery is concerned, going from 4,000mAh in the P20 Pro to an ostentatious 4,200mAh, matching the Huawei Mate 20 Pro. At the launch event, Huawei pointed out that while it’s put a bigger battery in these phones, the P30 and P30 Pro are in fact lighter in weight than rival iPhone XR and XS Max which house smaller batteries. Huawei claim that the P30 series will have a longer-lasting battery than the P20 series, improving on its performance by 27%. The P30 Pro will have 40W SuperCharge capability, to get you to 70% battery in an almost unbelievable 30 minutes. But the most exciting battery feature is the Wireless Reverse Charging function: using your P30 or P30 Pro as a power bank, you can charge anything from a smartphone to an electronic toothbrush on the rear of the phone. It will ship with Huawei’s latest EMUI 9.1 skin to pair with Android 9. Like the Mate 20 and Mate 20 Pro, the P30 series will have the gesture functions for you to swipe on the screen to perform tasks like returning to home or multi tasking. It will come booted with Huawei’s OneHop Technology, which by tapping the device onto a Huawei Matebook laptop enables you to transfer files to and from the laptop. Other features such as 3D modelling and AR measure (which uses augmented reality to measure the length, height or volume of real-life objects) is also available on the phone. Huawei has announced its partnership with carmaker Audi, to use the P30 and P30 Pro as an ‘Intelligent Digital Car Key’ in its cars. While there weren’t many details provided, Huawei did reveal that the technology is ready to be used with seven Audi models in more than 20 countries. How do Huawei smartphones compare to other Android brands? On paper, Huawei definitely looks like it’s raised the bar with the new P30 series. Huawei was clear in its competition against Samsung’s Galaxy S series, especially where innovations in camera and battery are concerned. But, how does Huawei fare overall when pitted against other Android brands? 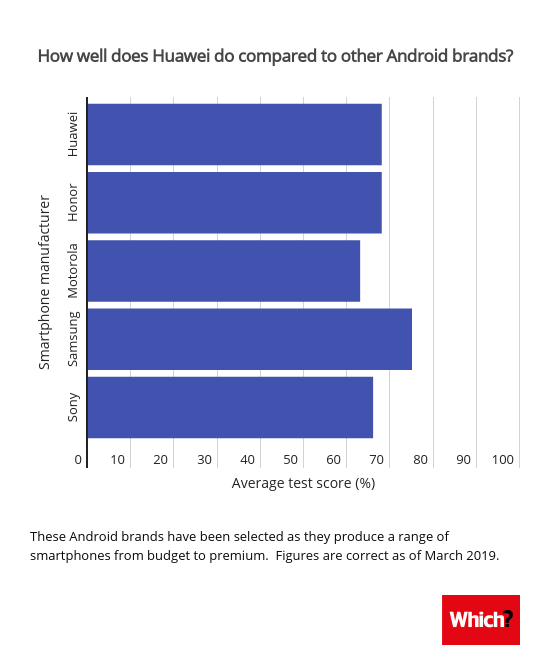 We have tested more than 100 Android smartphones and found from the Android brands that produce smartphones across the price spectrum, Huawei is one of the best. Samsung still takes the crown with an average test score of 75%, while Huawei is not far behind in a close tie with Honor at 68%. However, these results do not mean that the new P30 series will earn itself a Best Buy badge of honour when we put it through our tests. Keep an eye out for a fully tested review of these smartphones.